I came across a curious idea recently: a bookshop holiday. You spend a week or two staying in the flat over The Open Book bookshop, and part of the package is running the shop while you’re there. 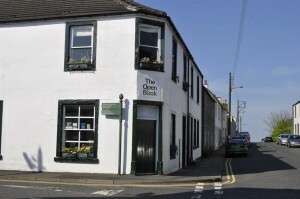 It’s located in rural Wigtown, Scotland’s National Book Town. There are many things that I love about this idea. This is the sort of holiday that appeals to people who love books. And let me tell you, as someone who is frequently a customer and who has worked in a chain bookstore, there’s nothing that customers appreciate more than when those working in the store clearly enjoy the subject matter. For those customers who don’t care so much about books, we help them get what they need with the minimum of fuss (because we actually know the book with the blue cover they’re looking for). For those customers who adore books, we’re a kindred spirit and they can geek out a bit without feeling self-conscious. It’s more personal; it’s more friendly. And as the worker, it’s way more fun. So the fact that they’re opening up working the store to those who love books? That’s a winner right there. The more jaded among us (and yes, I include me in this) will be thinking ‘they’re getting people to pay to work! It should be the other way around!’. It seems like a veiled way to expoit people. But let me tell you why I think that it’s okay anyway. First, see the section above. Are they really slaves if they adore what they’re asked to do? It’s not like it’s a hardship. Secondly, it’s really cheap, as accommodation goes. Also, you get to hang out with books all day. Or all evening, if you like. The hours are all up to you. It’s also showcasing indie bookstores as an entity. I’ve seen the link to this holiday opportunity in a couple of places online, and reactions to it not unlike mine (roughly: omg squee!). People are wondering what it would be like to run their own bookstore, and what cool places they might be to hang out in. Encouraging all of this is supporting a part of the industry that is under pressure (threat?) at the moment. In running the bookshop, you’re given complete autonomy (within a very reasonable set of requirements). All they ask is that it’s open for 40 hours a week; which hours it’s open is up to you, and what you do during that time is also your choice. You’re encouraged to be creative. Design displays, hold events, do readings. In one case, a couple play book-related music live in the store. They also encourage you to blog about it (like I said: smart!). There are ten (!) bookshops in this particular little town (that’s why it’s Scotland’s National Book Town), and the booksellers in other stores give guests help and support with practical guidance. Newbies don’t need to worry that they won’t know what they’re doing. This is a hard question. Money and opportunity are big restrictions for me at this point in my life. Energy is also an issue, and the notion of working through a break from work is pretty crazy for me. There’s only one bed in the flat above the store, which is great for a couple, but I’m not currently part of one. I don’t know if I’d want to take this on alone (it would be so much more fun with a co-conspirator). But, all concerns aside, I’d love to. I think it would be wonderful fun, and Scotland is pretty to explore. I’m clearly not the only one: it’s fairly well booked right through next year. The real question is: would you?